Server Maintenance is the process of keeping the server updated and running to ensure that the organization’s computer network is operating smoothly. The network administrator usually does this, and it is crucial to the performance of the business. Without a proper IT service plan, the application software will never run as expected. In severe cases, the network can even experience partial or total failure leading to severe losses to your business. Any techie knows that servers are essential when it comes to, well, pretty much anything computer related. Thanks to the hard work of your server, your computer runs smoothly and efficiently. Which is why, server maintenance is such a big deal. Just like you go to the doctor for regular check-ups to make sure everything is healthy and whole, servers also need to be regularly monitored to ensure that all parts are working optimally. While we usually only go to the doctor once or twice a year, servers need constant attention. Servers run 24/7, carrying out strenuous jobs. They need to be continually checked, fixed, and updated. Because there is so much that goes into server upkeep, companies often just buy a server IT maintenance plan from a managed IT services provider. 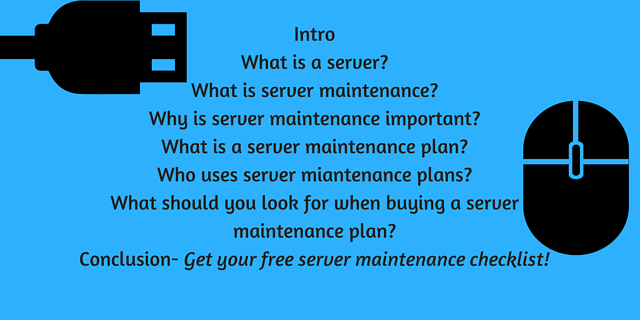 Which brings us to the main point of this article: What is a server maintenance plan? 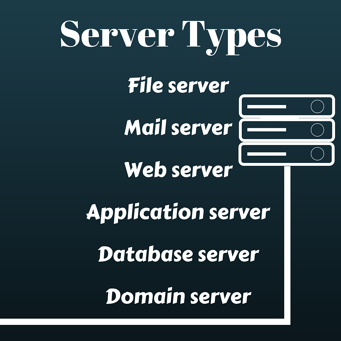 But, before we get into that, it is important to understand exactly what a server is and what it does. 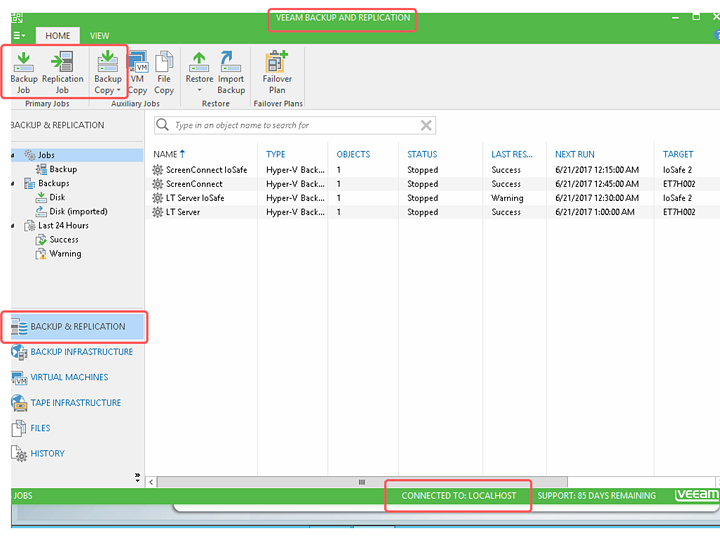 Having this working knowledge will help you to understand the entirety and significance of server maintenance. It is made up of similar components to your regular desktop computer, like a motherboard, processing chip, memory etc. But the parts of a server are sturdier and designed to handle more exhausting jobs. For instance, servers have a much larger memory capacity than regular computers because they have more RAM. Having more memory, requires having higher quality parts to support that high storage capacity. Servers are built to provide maximum computing power while utilizing minimum space. So, what exactly do servers do with all that extra power? Well, servers are made to process data ‘requests’ and provide the corresponding information. This information is either sent back to the original requester or to other computers via the internet or a local network. Basically, servers can be defined as access points on various networks. Servers must be attached to some kind of network so that users have a way of connecting to the servers and retrieving the information stored on them. This is extremely important because allowing users to access information is essentially the whole point of a server. 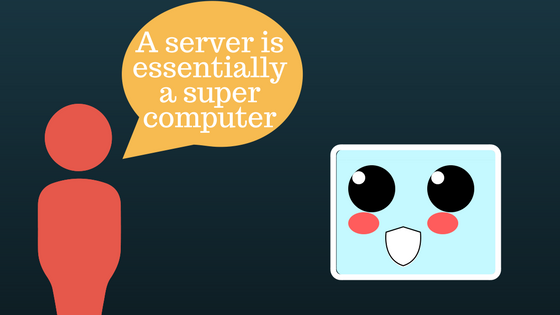 Whether you realize it or not, servers are a big part of common, everyday life. 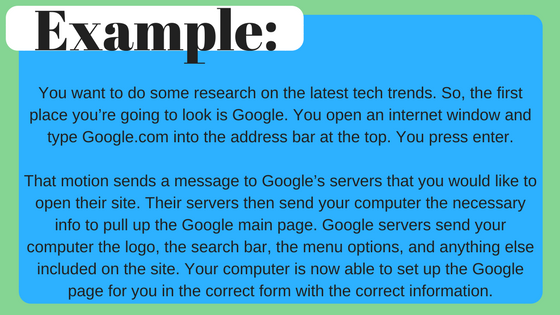 Whenever you type a web address (URL) into your browser, you are sending a request to that site’s server. The server then processes and answers your request by giving your computer the information to pull up the site. This is called the client- server model. 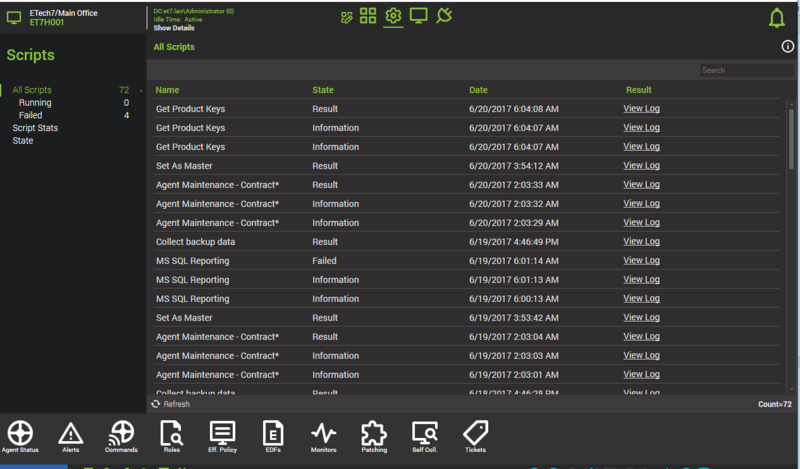 The client is your computer, phone, or other electronic device asking for information; The server is, well, a server providing you with the stored information. In addition to being used for internet information, servers can also be used across local computer networks. In fact, this is very common in workplaces. When you create a username and password that allows you to log onto any computer in the office, your information is being stored on your office servers. This is why you can save documents and pictures on one computer and still be able to open them on another. The information is simply being stored on the servers which can be accessed by any computer that is a part of the local network. Every server is designed to provide a specific service. For this reason, there are many different types of servers. Servers are usually set up in groups. Since each server only does one type of job, you won’t often see a standalone server. 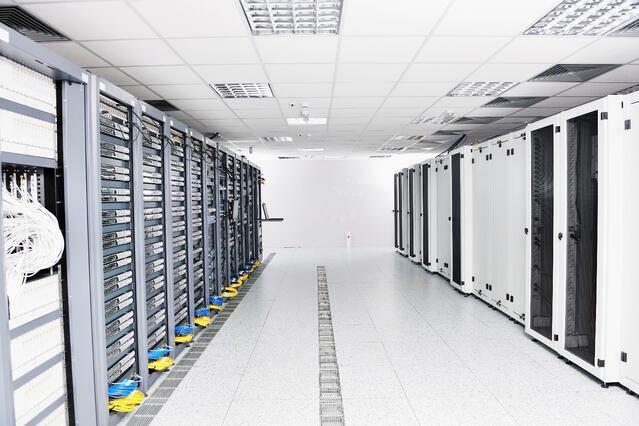 Rather you’ll see a room of many servers all lined up neatly in what looks like a big bookcase, called racks. Organizations install multiple servers together to increase the processing power available to support several databases, systems, and applications. There is also such a thing as server virtualization. Virtual servers are considered to be cost and energy efficient because they share hardware and software with other operating systems. Server virtualization works by applying a software application to a physical server 'splitting' the server into multiple virtual servers. Bascially an inception of servers. So, you have only one physical server, but other virtual servers stored within that one. The benefit of this, is that you can access the virtual servers straight from your computer, rather than having to stand in front of the server box. Still reading? We thought so. By this point, you should be starting to see why servers are so crucial to everyday performance. They basically store all the information you need and use each and every day. Without servers, you wouldn’t be able to get even half as much done, half as efficiently. Which is why, server maintenance is so important. You want to be sure that the thing that lets you work, is working smoothly itself. Server maintenance is the process of keeping the server updated and working in tip top shape. Because servers take care of all your data, it is important to watch and properly care for them so that you don’t lose valuable information in case of an error. Such maintenance involves constant monitoring and continuously analyzing how the server is functioning. This way, if anything happens to the server, you will know right away and be able to quickly fix the problem before it affects your work. In addition to paying attention to current needs, server maintenance also includes preemptive measures. You want to keep your servers protected and updated before something goes wrong. Preemptive maintenance not only reduces future server issues, but also prepares your network in the event that something goes wrong. It is important to note that server maintenance includes both virtual and physical maintenance. While the virtual configuration, like software updates and back-ups, may be obvious, physical care can often be overlooked. But it is just as significant. Servers need to be regularly dusted and cleaned so the vents and airways do not get clogged. Servers also need to be kept in rooms with very cool temperatures and good air circulation so the machinery does not overheat. Overheating can damage server equipment. So, if you’re planning on going into a server room, make sure to bring a sweater! Think of server maintenance as putting gas in your car. You wouldn’t wait until you completely run out of gas to go buy some more, because at that point you wouldn’t be able to drive any further. No, you want to fill your car up with gas before your car is on empty. You fill up your car as you need, but you also think ahead and put in extra for the longer trips. Server maintenance is no different. You want to take care of your server before it’s too late, maintaining current needs, while also looking to the future. You might still be wondering, what does server maintenance have to do with you? Regular server maintenance is crucial to your business. If you are a small (or large) company, chances are high that you have multiple servers on your network. In order to keep your business’ computer network in optimal and reliable condition, you need to have regular server updates, installation of patches, and diagnostics. Taking proper care of your servers will increase their life spans while saving you time and money. This upkeep will spare you having to buy a new server and moving all of your data from its original home prematurely (yeah, server failure is not fun). But with regular maintenance, your business’ precious hardware and software will have a greater chance of serving you for a long time. Good server maintenance also boosts server productivity which, in turn, boosts your overall business productivity. Routine server maintenance will keep your server functioning at top speed. This will not only save you time, but also increase your work efficiency. Properly monitored servers also give you the assurance that if anything goes wrong, you will be able to easily recover any lost or damaged data. This way, you can get your systems back and working before your clients even have the chance to notice there was an issue. Server maintenance is about being proactive and staying ahead of the game. 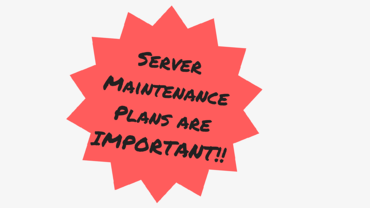 What is a server maintenance plan? Server maintenance is something that needs to be done routinely. 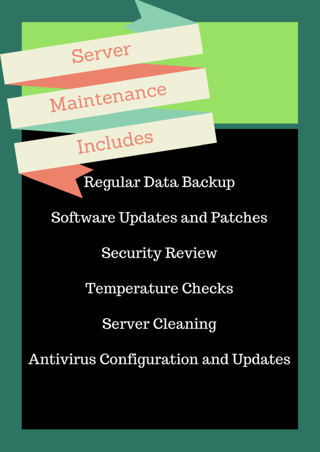 In order to keep up with server maintenance, it’s important to create a detailed list of the what’s and the when’s. This is what we call a server maintenance administration plan. A server maintenance plan is simply a blue print for what server elements you are going to check up on and how often. Like a schedule or checklist. It is important to consider how often you want to perform server maintenance. 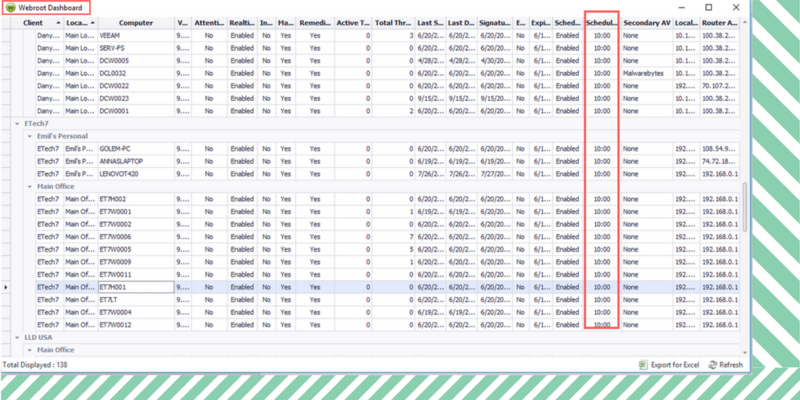 Some server configurations need to be monitored daily, like data backups and email routing. 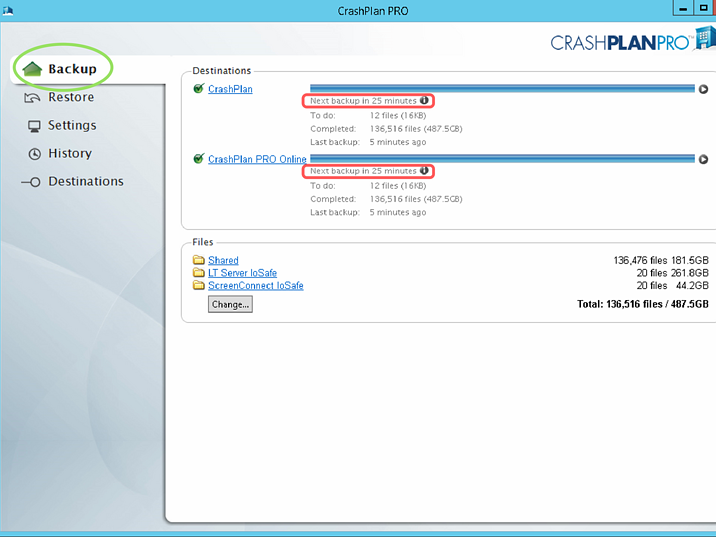 Others only need weekly or monthly maintenance, like reviewing server memory and hard disk space. How often you need to monitor certain server configurations can also depend on the age of the equipment. You can create and implement a server maintenance plan yourself or you can buy a plan and the IT services that come with it. Although server maintenance is crucial to business, too often companies do not have the time or know-how to conduct it. In such cases, companies can buy server maintenance administration plans from managed IT services providers. Buying a server IT maintenance plan is essentially hiring a team of IT professionals to be responsible for the upkeep of your servers. The IT professionals you hire become your network administrator who will take care of everything server related. The network administrator is in charge of making sure the servers are functioning as efficiently as possible. 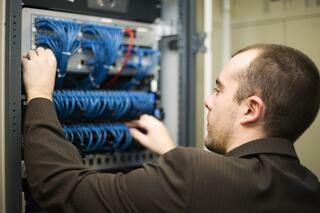 Proper network server maintenance also requires the network administrator to conduct regular preventive maintenance. This involves routine reviews of the servers' performance and any potential security risks as well as backup protocols. As part of preventive maintenance, the administrator should ensure that the inbuilt system monitoring utilities are appropriately installed and configured. If you are not proficient in IT, buying a server maintenance plan is highly encouraged. There is a lot that goes into the upkeep of servers that you may not be aware of. There are also a lot of different options and variables when it comes to creating a maintenance plan. This is why it is a good idea to consult with IT professionals for advice and recommendations. With outsourced IT support, you can have experts monitoring your servers round the clock, thus keeping your business operations at their peak throughout the year. 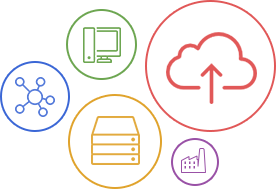 Professional IT services companies will work with you one on one to help create the best server maintenance plan that works for you and your business. Who uses server maintenance plans? Any company that uses computers and servers should have a server maintenance plan. Larger companies often hire in-house network administrators to take care of the server maintenance as they need someone 24/7. For small and start-up sized companies, it is often recommended to hire out-of-house network administrators. Smaller companies do not usually need the same 24/7 constant attention that larger companies need, and so it can be a waste of financial resources to hire a personal IT employee. For this reason, startups usually prefer to invest in a server maintenance plan from an IT service provider. The provider will help set up the best plan, based on your personal financial and service needs. 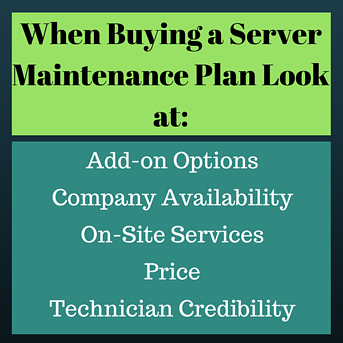 What should you look at when buying a server maintenance plan? Server management plans generally have a fixed monthly rate. There may also be additional fees for occasional, more specialized projects. When buying a server maintenance plan, make sure the plan includes on-site service hours. Meaning, if you have any on-site server or network troubles, the IT company will send over technicians to fix the problems. Usually only a certain amount of on-site service hours is included in a maintenance plan. Be sure to check how many hours they are providing you with and how much you are paying per hour. It is a good idea to inquire about the IT technicians’ certificates and awards. This way you can be sure you are getting top-notch service. 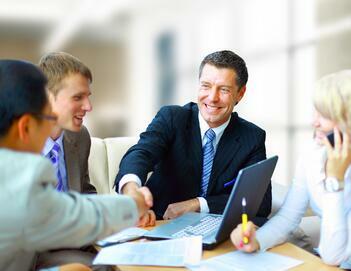 You can find out about the IT team when you go for a free consultation. You also want to check up on the company’s availability. If something goes wrong with the server, how fast can a technician get to you? Really, the most important part of a successful and effective maintenance plan is to design one that is right for you and your business. Every organization has its unique goals and server needs, so you want a maintenance plan that takes into consideration the unique objectives and demands of your business. Servers play a huge role in everyday computer usage, and they require proper care just like anything else you consider important. Take the time to set up a server maintenance plan so you can clearly see what your server needs and when.